Karen Resta at Goldman Sachs. To read more go here. 1. Slave girls peeling us fat green grapes. 2. Houseboys pouring champagne for us while flicking a bit of bubbly foam delicately onto our blandly waiting necks. 3. The butler and the maid who don’t really exist aside from being a butler and a maid in dense black wool and gleaming white cotton. 4. Not our mother. Never our mother, even if we hate her. Unless of course it’s a wife. A wife can remind us of our mother when we’re thinking of servers, whether we hate our mother or not. 5. The “Tough Waitress with the Heart of Gold”. Her stockings will necessarily have a bad run in them. 6. Is there a Tough Waiter with a Heart of Gold? Why or why not? Someone in a uniform rushing to carry food items to someone not wearing a uniform then carefully placing the food on a table in front of the un-uniformed person who will then enjoy the food at their leisure while the uniformed person waits to bring the seated person more food should they desire it. This small drama ends when the person at table chooses to end it by standing up and leaving the table. I used to be the manager (“manager” is not a preferred word in today’s workplace, “leader” is, but somehow I can’t think of myself as being The Server’s Leader) of a number of waiters and waitresses. Once I found a waiter with a waitress together underneath a large table, apparently having a moment of passion with their clothes still on - or somewhat still on, anyway. The best servers I ever hired were German women aged 50 to 60 years old. They did everything to perfection and loved doing it. I’ve never been a server, though I’ve served tables. I’ve been a chef. When you “serve” a table as an Executive Chef, you carry with you a soaring untouchable power that meets or exceeds the power of those at table, no matter who or what they are on any kind of playing field. Why this is, I can’t imagine. It’s not that you insist upon it, actually the people at the tables do. 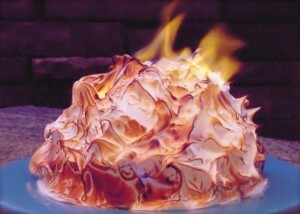 To discern whether an applicant for a server job would be a good candidate, ask them if they’ve ever served a Baked Alaska. How they respond will show the level of heartfelt investment they have for the job – even if they don’t know what a Baked Alaska is – and heartfelt investment in being a server is the ultimate predictor of vocational success. If their eyes gleam at the thought of a huge baked meringue filled with cake and centered with ice cream being set on fire in front of the person who’s going to eat it, they’ll be great! I once rolled an elegant gleaming cherry wood and brass pastry cart into a very formal private dinner meeting of twelve men of high status, your usual ruler of the universe kind of guys. Three waiters walked behind me with linen napkins over their arms. On the cart itself was a beautifully glazed crisp and crackling whole roast baby goat of about four feet long with an apple stuck in his mouth. The goat was almost tumbling off the top of the cart sideways, it was so large – we had to move very slowly into the room and toward the group at the table. None of those men had expected to be served a whole roast baby goat for dinner. None of them had expected it at all. The building I lived in when I first arrived in New York City as a 14-year-old throwaway/runaway is still standing. It’s on the corner of Red Hook Lane and Livingston Street in downtown Brooklyn. Red Hook Lane itself, which is all of two blocks long, apparently has been there even before the British and Dutch arrived in Brooklyn as an Indian trail. I don’t know, actually, whether there were any servers (part-time or not) in the area back when it was an “Indian trail” (and sorry, but I can’t find any synonyms for that phrase). But most everyone I knew when I lived there was a waiter or a waitress, most of them trying to get their foothold in the theatre or music or art world. The building’s been painted in shudderingly garish colors at some point in recent years with a design like a subway map, which makes it look odd to me – back then it was just a very dull, very cheap place to live. They’ve also made it into a Landmark Building. My boyfriend Michael, a professional musician who once played backup for James Brown but who more often did studio gigs, played scales on the trumpet directly into the one miniscule closet to mute the sound as he sat on a folding chair in that apartment. He’s no longer with us. He died too young. I also don’t know where anyone is now who I knew back then - all the waiters and waitresses with all the futures they dreamed of ahead of them as they carried burgers, steaks, salads, coffee to people at their tables who apparently did have their futures already as well as the money to pay for someone to carry them burgers, steaks, salads and coffee. That building survived by being of service, but not actively of service. It sat there as a concrete lump with narrow staircases and uneven linoleum hallways leading to vaguely sad warrens of rooms various human beings lived in. It served and survived, the building, by doing nothing. Not by smiling, not by carrying heavy loads, not by learning any choreography between kitchen, chef, food, diner, manager, mood, theatre, temperature, texture, relationships. It survived and they call it a landmark. But there’s no poetry in that. And there is poetry, inexplicably - or at the least, there is poetry undiscovered, every time someone approaches a table carrying any kind of food to be given to someone else to eat. Poetry and choreography. But that’s not what the work of being a waiter or waitress is named when defined by sociological and anthropological studies. There, the term used is “emotion work”. We always hope to find a Nureyev or a Pavlova waiting on us as we sit and reach for the menu. Often we don’t. But in the long run, it doesn’t matter. There’s still a great and terrible poetry in any person who tries to dance the vital steps required while approaching tables with hungry people awaiting them – in this role where art, craft, and the ephemeral come together to define “the human who serves”. Karen Resta is a woman with a story. At one time she was the executive chef at Goldman Sachs, the first woman to hold such a position. You can find her at The Danforth Review, The Best American Poetry Blog, The Christian Science Monitor, The Red Rose Review, One Million Stories, Serious Eats, eGullet, The Gilded Fork as well as at her own blogs foodwritingencyclo, foodgeekology, and Postcards From the Dinner Table. She lives in a part of Brooklyn nobody ever talks about.